The error statement states that there is no further space left in IBM Notes to record the transactions or generate new database components. At this stage, it now becomes compulsory to delete useless data from the email client and hence, free up the storage space. Note: The job of mail routing will be continued where users will be able to send/receive emails and also give a response to them but, will not be able to save those emails locally. In general, ‘Lotus Notes mail quota exceeded’ message is the outcome of improper database management system. Such hassled condition arises when there are duplicate emails in the mailbox, numerous amount of designing components in NSF database, or multiple drafts creations. Although there might be a point asked by end users that they delete duplicate items, still the error occurred? Then, answer to this query is that eliminating identical items or unnecessary drafts does not decrease the database size instead, they get to reside in Trash folder that means they are still present in NSF file. 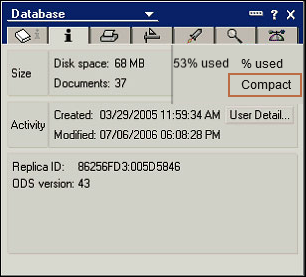 Therefore, in the further section, we are going cover up possible solutions on how to manage Lotus Notes database file size limit. After deeply analyzing the requirements, one should set the maximum size at certain extend. In order to provide sufficient amount of time, admin should set the warning threshold ranging between 75 – 90%. Note: If required then, users can modify setting through Set Quotas option, which is provided only to the Domino Administrator client. Eliminate Useless Emails: An email message not only comprises of a content but, also contains attachments of a certain size. Therefore, it should be in the notice of each and every user that emails occupy a lot of space in the database. Hence, in order to debug the issue permanently delete unnecessary emails and free up space for new ones. Manage Email Attachments: After reading the entire message, download & save email attachments locally on your system and then, shift delete that email. 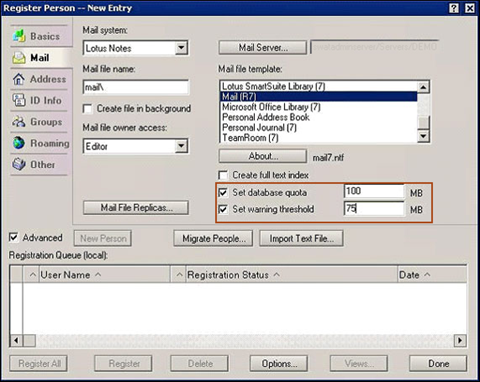 This tip should be in practice of every email client user so that they do not face any type of such issue further. Change Default Settings: In general, whenever you are sending an email message it gets stored in Sent box. In order to decrease the size of the NSF database file, disable this saving setting and hence, automatically eliminate sent items. Only Keep Crucial Documents: It is a general fact that all emails of the database file are not important for an end user. Therefore, try to keep only those emails, which are essential for a person and permanently delete the remaining ones. In addition to this, one can also delete old entries of the calendar, notes, etc., and make space for new components. It might be quite difficult for a person to carry out management process manually via Domino settings. In such case, we are providing an automated approach to resolve Lotus Notes NSF file size limit issue. Readers can opt for NSF Splitter software that enables users to fix this problem without any error. The tool enables one to break down the large database of IBM Notes in smaller parts in a hassle-free manner. One should take this in practice that they have to permanently delete emails from their accounts, which are not necessary for them. In the blog, we have demonstrated all the factors that will provide you all possible answers on How to manage Lotus Notes NSF file size limit. Hope that this will definitely help users in fixing the size issue and hence, experiencing smooth working in IBM Notes.